Florida Man Awarded $37,500 After Cops Mistake Glazed Doughnut Crumbs For Meth : The Two-Way Police departments across the country use inexpensive field tests to quickly screen for drugs. But the kits create a lot of room for error — with troubling consequences. 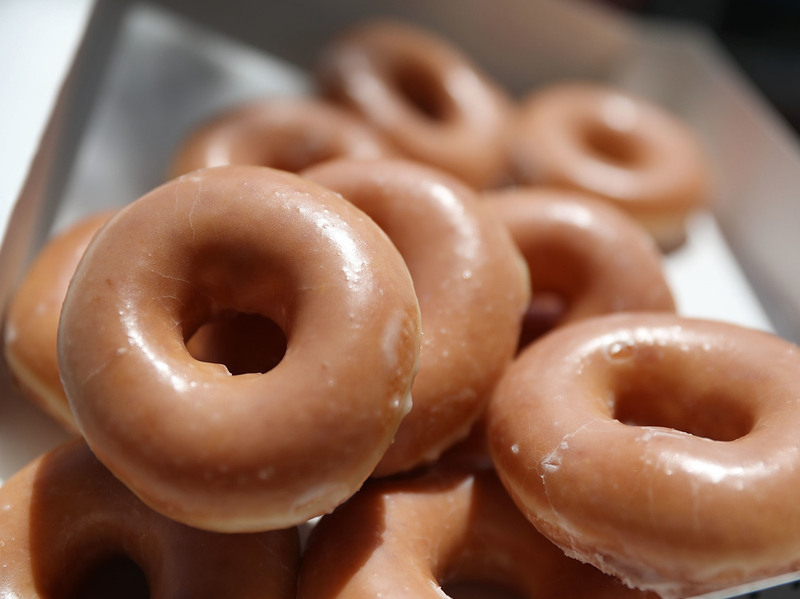 A Krispy Kreme doughnut was to blame for a white substance that led to an Orlando man being jailed on drug charges. Results from roadside drug test kits conducted by law enforcement officers can be unreliable. It sounds like a joke, but, well — keep reading. In December 2015, 64-year-old Daniel Rushing had just dropped off a friend at chemotherapy and was driving home an older woman from his church who worked at the 7-Eleven and would otherwise walk the 2 miles home. As Rushing drove away from the convenience store, police pulled him over. The officer said he had been driving 42 miles an hour in a 30 zone and had failed to come to a complete stop before entering the roadway. When Rushing handed over his driver's license, Officer Shelby Riggs-Hopkins noticed his concealed-weapons permit. Rushing confirmed he had a pistol, and she asked him to step out of the car for her safety. The officer then asked if police could search his car, and Rushing said sure — if it meant he wouldn't be ticketed. Rushing watched as the officers, who now numbered four, conducted a very thorough inspection of his car. Finally, Riggs-Hopkins said to him, "You want to tell me about what we found?" "There's nothing to find," he said, confused. But Riggs-Hopkins had noticed some crystals on the floorboard of the car, and when officers used a field testing kit, the white substance tested positive for methamphetamine. Rushing said that was impossible: "I've never even smoked a cigarette," he protested. The officer showed him the substance in question, and Rushing was aghast. "That's glaze from a Krispy Kreme doughnut!" he explained. "I get one every other Wednesday." But officers weren't buying it. Rushing was booked on charges of possessing methamphetamine while armed with a weapon. As he sat in jail, he asked himself, "Lord, what am I doing here?" "It was funny," Rushing says, "because I called my wife to tell her what happened, and the guy next to me waiting for the phone started to laugh. He said, 'This is crazy. I think you got a real good lawsuit here.' "
He spent more than 10 hours in jail before being released on bail. All charges against Rushing were dropped. It would be a funnier story if it hadn't been so closely replicated in Oviedo, a Florida city northeast of Orlando. Karlos Cashe was pulled over in March for driving without headlights and arrested by Oviedo police when court records showed that he was out past his court-ordered curfew. Those records were later shown to be out of date and inaccurate, ABC affiliate WFTV reported. Police saw white dust on the floorboards of Cashe's car and tested it with a field kit. The substance showed positive for cocaine. Cashe went to jail for 90 days – 90 days in which he knew that the white substance in his car was simply drywall dust. "I know for a fact it's drywall because I'm a handyman," Cashe told WFTV. "I said that continuously during the arrest stop." Police in Orlando and Oviedo, like many other law enforcement agencies, use inexpensive field kits to test for drugs. Orlando's police use NIK brand narcotic testing kits. A NIK general screening kit, which tests for opiates, meth and other drugs, costs just $18 for a box of 10. But such roadside test kits are far from foolproof. "Some tests ... use a single tube of a chemical called cobalt thiocyanate, which turns blue when it is exposed to cocaine. But cobalt thiocyanate also turns blue when it is exposed to more than 80 other compounds, including methadone, certain acne medications and several common household cleaners. Other tests use three tubes, which the officer can break in a specific order to rule out everything but the drug in question — but if the officer breaks the tubes in the wrong order, that, too, can invalidate the results. The environment can also present problems. Cold weather slows the color development; heat speeds it up, or sometimes prevents a color reaction from taking place at all." Data from the state law enforcement lab in Florida found that 21 percent of the evidence recorded by police as methamphetamine was not in fact methamphetamine, and of that, half was not illegal drugs at all, according to the ProPublica investigation: "When we examined the department's records, they showed that officers, faced with somewhat ambiguous directions on the pouches, had simply misunderstood which colors indicated a positive result." Those findings are part of what spurred Rushing to file a lawsuit against the city of Orlando after the charges against him were dropped. Two weeks ago, Rushing says he reached a settlement with the city for $37,500. "I thought [the lawsuit] was the right thing to do, for what they did to me," he tells NPR. An Orlando police spokeswoman says that after the Rushing incident, the department conducted an internal investigation and officers received additional training in using the field kits — but it's still using the same NIK narcotic test kits. The Safariland Group, which makes the NIK tests, told ProPublica that it provides all law enforcement agencies with comprehensive field test training manuals, in addition to its instructions, and says its products are not intended for use other than directed. "These training materials, which outline protocols for use, clearly state that the tests are presumptive aids that serve only as confirmation of probable cause and are not a substitute for laboratory testing," the company wrote in a statement. For his part, Rushing bears no ill will toward the city's police department and says that the arresting officer was "very polite and nice." He worked alongside the police as a parks department employee for more than 25 years, and his brother is a former Orlando cop. He says the issue is that the department keeps using the kits, despite the well-documented problems with using them. "These kits give a false positive 1 out of every 5 times," he says. "I'm thinking about running for statehouse next year. And if I do, I'd like to get something done about these kits." With the lawsuit behind him, Rushing's next step is getting his record expunged. He says he would like to find more work in security — but it's been hard to get business with a record showing an arrest for possession of meth while armed. After the glaze incident, Rushing stopped by his local Krispy Kreme to let the people there know they might be in for a little publicity. Sometimes they give him a free doughnut. "But I don't eat them in the car," he says, laughing.